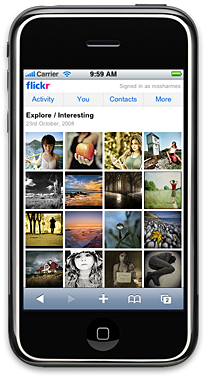 A few weeks ago we released a version of the Flickr site tailored specifically for the iPhone. Developing this site was very different from any other project I’ve worked on; there seems to be a new set of frontend rules for developing high-end mobile sites. 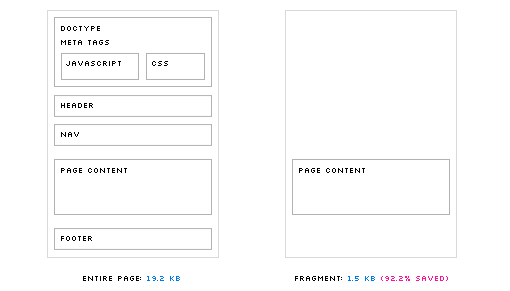 A lot of the current best practices get thrown out the window in the quest for minimum page weight and fastest load times over slow cellular connections. Here are a few of the lessons we learned (sometimes painfully) while developing this site. This was one of the hardest things for me to come to terms with. I’m a huge fan of libraries, especially YUI, mostly because they allow me to spend my time creating new stuff instead of working around crazy browser quirks. But these libraries walk a fine line; by definition, they must work across a wide array of browsers and offer enough features to make them worth using. This means they potentially contain a lot of code that you don’t care about and won’t use. This code is dead weight to your site. It’s really tempting to build the site for just the iPhone: you can use modern CSS (including things like CSS3 selectors and transformations), you don’t have to hack around annoying browser quirks, and testing is extremely easy. But any single device, even one as ubiquitous as the iPhone, has a limited share of the mobile market, especially internationally. Rarely can you justify the cost of creating a one-off site for a very small number of your users. Luckily the current generation of high-end mobile browsers is excellent in terms of support for modern features. Many phones use a WebKit derivative, including the iPhone, and Symbian and Android phones. Other phones either come with or can use Opera Mobile or the new mobile version of Firefox (called Fennec). For the most part, very few changes are needed in order to support these browsers. In the end, we were able to go from 90+ second load times over EDGE to less than 7 for an empty cache experience. Using page fragments, we are able to load and display new pages in under a second (though the images in those pages take longer to load). These are not trivial gains, and make the difference between a good mobile experience and a one that is so awful the user gives up halfway through the page load. Once we hijacked all clicks actions in order to load page fragments, it wasn’t always clear to the user if anything was happening when they clicked on a link. This is especially true on touch devices, where it is difficult to know if the device even detected your action. To combat this problem, we added loading indicators to every link. These tell the user that something is happening, and reassures them that their action was detected. It also makes the pages seem to load much faster, since something is happening right away; if the indicators weren’t there, it would seem like nothing was happening for a few seconds, and then the page would load suddenly. In our testing, these indicators were the difference between a UI that seems snappy and responsive, and one that seemed slow and inconsistent. The iUI framework implements a lot of these practices for you, and might be a good place to start in developing any mobile site (though keep in mind it was developed specifically for the iPhone). We found it especially useful in the early stages of development, though eventually we pulled it out and wrote custom code to run the site. I'm lucky enough to lead one of the best frontend teams in the business at Flickr. Want to join? We're hiring!